In Art Nouveau > Art Nouveau Metalwork > Show & Tell and Furniture > Boxes > Show & Tell. Opalescent cabochon and repousse worked brass covered wooden box with prototypical Daguet L' Art Nouveau-style steep hinged rectangular lid. The decorative motif appears to be blackberries, and as is typical of most of Daguet's work the design is symmetrical and continued on all sides. This desk box is doubly special, however, not for the theme or materials used, but because the original fabric lined interior remains in very fine shape. Too often on these Daguet boxes the interior lining has long been stripped from the piece. Appropriately signed and dated "Cuivres Bing / Alf. Daguet 03" on the reverse of the hinged lid. Dimensions: 12.6”(L) x 4”(H) x 4.8”(W). Alfred-Louis-Achille Daguet (Paris, 1875 - 1942). Daguet's early years are shrouded in mystery and little is known other than he was a pupil of Jean-Leon Gerome and Charles Clairin. In 1900, Daguet appeared quite suddenly on the Parisian art scene when his intricate metal works were exhibited by Siegfried Bing in his famed boutique L'Art Nouveau. A sizeable number of Daguet's works from this period are labeled, "Metaux S. Bing" or "Brass S. Bing," as if there were actually a special department for working metal or copper in Bing's gallery, but the real work was being conducted by Daguet himself in a studio directly above L'Art Nouveau. At the Paris Salon of 1903 and 1904, Alfred Daguet exhibited seven objects which were done in repousse' copper. For this exhibition Daguet gave his address as 22 Rue de Provence. In 1905 Bing closed his gallery L'Art Nouveau, after which Daguet moved his metal studio to the Rue du Faubourg-Saint-Jacques where his clients included Sarah Bernhardt and the Barrymores, Maurice and Lionel. In 1910, Dauget exhibited at the Salon of the Societe des Artistes Francais metalwork in "modern style" and ten more in a "different style." 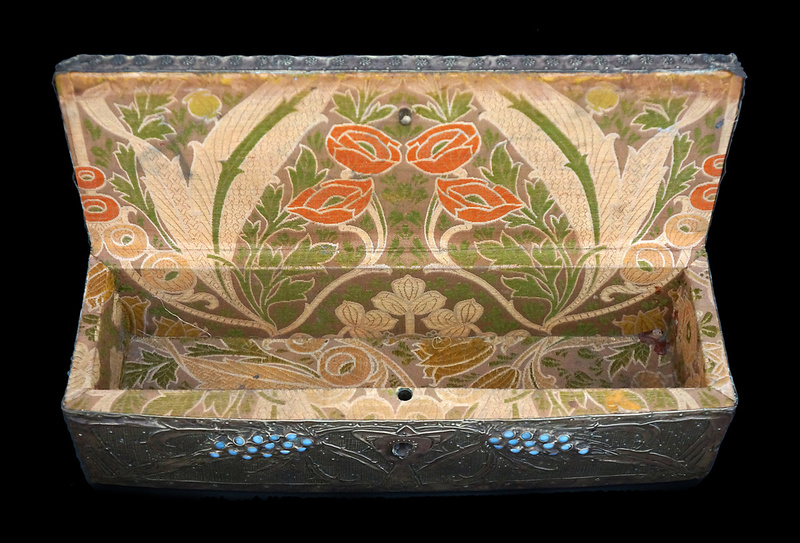 The box above likely represents an example of the "different style," given the new mixed materials used (i.e., early period = copper/cabochons; late period = copper/brass/iron/enamel/cabochons). One of his last dated works prior to World War I is a mixed metal mirror frame from 1912, which was owned by Sarah Bernhardt. During World War I Daguet was assigned as Sergeant Mechanic 2nd Aviation Group. During this time, he produced approximately 2000 sketches of various French and foreign early aircraft; designed numerous aviation manufacture advertisement posters; and was given the moniker of "true apostle of aerial art" based upon the scrupulous accuracy of the technical details and a keen sense of observation in his paintings and illustrations of the period. Attendees to an art exhibition that featured military aeronautics, held in 1919 in Paris, especially praised his watercolors of both French and foreign aircraft. An extensive collection of Daguet's aviation drawings and watercolors (~2000 drawings & 115 watercolors) is in the Musee de l'Air et de l'Espace at Le Bourget, near Paris. After a 16 year eclipse during the War and successful aviation illustration stint, Daguet returned to decorative metalwork and exhibited largely religiously themed pieces in decorative hard steel and bronze in 1926 at the Musée Galliera. i'd love to see a pic of the outside too. Uploaded finally. Sorry. Don't know why it didn't like the other view pictures. Thanks for the loves folks. If I had to pick a favorite designer from the Art Nouveau era, Daguet would be the one. His motif here and on most L'Art Nouveau retailed wares are pretty conventional, but after the gallery closed down he started working in a wild style filled with Celtic motifs, fantastical animals and mysticism. This was prior to his completely retooling as an aviation illustrator during WWI. Very versatile artist. Thanks kivatiniz! It sits on my bedside table and still is very utilitarian.